When I bought my modest 2,300-square-foot suburban home, I was pretty keen on the idea that I would automate it myself. Seriously, how hard could it be? Or, so I thought. The typical person who gets the itch to automate their own home is a lot like me: technical and self-reliant. And possibly a little cheap. Color is something that can intimidate even the most veteran designer; however, interior designer Toni Sabatino says that her signature approach to color comes not so much from focusing on color in the space as much as focusing on color with the people—using color to create rooms her clients feel comfortable in. Read on to discover how this leader in the kitchen and bath arena approaches new projects, what she is most excited about in smart-home technology, and how she stays inspired in the ever-changing design world. The East Coast has the distinction of having some of the oldest cities in the U.S., and its architecture reflects it. Charming, vintage homes are lovingly preserved by their owners, paying homage to a time long ago. But this doesn’t mean modern technology shouldn’t take up residence in an older home. You just need to choose the right types of products. For homeowners striving maintain the integrity of their historic abodes, or for anyone concerned about the impact of technology on a home’s design, wireless products offer an ideal solution. 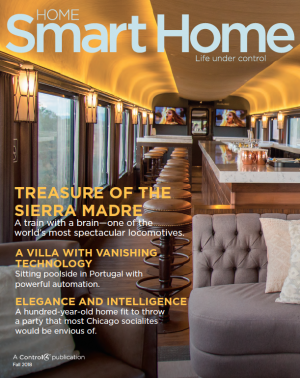 From a wine brand that has tapped into augmented reality, to a major locomotive that is automated to the hilt, I invite you to jump aboard and join me for an issue that’s straight off the rails. We sat down with award-winning designer Rose Barroso to ask her about where she finds her inspiration, her struggles and successes in the industry, and how she makes contemporary design just look so good. For 15 years, we've been unwavering in of our commitment to our dealers and in our passion to delight customers around the globe. Control4 is fortunate to work directly with over 5,700 amazing custom integrators; some of whom have been with us for a short period of time and many others since Control4's inception. However, all of them have something in common: dedication to providing excellent service and giving you the Control4 Smart Home of your dreams! Whether you're a Control4 homeowner, a smart-home hopeful, or someone who designs or builds modern homes, you should know that Control4 is committed to creating a user-friendly smart-home platform that can be easily personalized by homeowners and that we strive to develop products for smart-home projects of every size. Being away from home doesn't mean you can't stay abreast of what’s happening while you’re gone. Thanks to innovative technology from Control4, you’ll know the second someone rings the doorbell, if there’s someone strolling across your backyard, or if your trusty neighbor remembered to water your plants. All you need to stay connected is a Control4 mobile app on your smartphone and an Internet-enabled monitoring device at your home. We sat down with award-winning Canadian designer Karen Sealy to talk with her about everything from business to psychology to her latest venture, The Pickering Project. I’m busy, you’re busy, we’re all busy—living. If you are a busy, on-the-go person like me, then you know that communication and time management is key to making it all work. That’s why I love discovering and playing with new technology and apps that help me stay connected and organized. Live your best life with smart-home technology. A smart home means more than just convenience—it means safety, as well. Secure your loved ones and your home by monitoring and controlling security cameras, locks, alarm systems from your mobile devices. You could even have your home simulate occupancy to deter mischief and crime ​while you're out of town. If you’re an audio visual enthusiast, it’s likely that you often find yourself daydreaming about the ultimate home theater. A cinema that provides exceptional audio and visual quality, superb comfort in seating, and luxurious décor that sets the mood. What TV would best display your favorite movie scenes? What sound system would would knock your socks off? What seats would make you never want to visit any other movie theater? Should budget be of no concern, we compiled a list of home theater features that you’d no doubt desire. Keeping the grass and plants looking their best requires conscientious watering, at the very least. A seemingly easy task, it’s can end up being the bane of your backyard. Too much or too little water can jeopardize the health of the greenery—taking your home’s curb appeal to ground zero. Yanking a hose around the yard is no fun, and there’s no way of knowing when to stop watering. A sprinkler system is a better option, but again, creating a watering schedule is like pinning down a time for a family dinner: you never really know if it’s going to work or if everyone will be adequately fed. Music is the heartbeat of Chicago. For every musical taste, there’s a venue, a concert, or an event to soak in your favorite songs from your favorite artists. There’s nothing like hearing music live, especially in a scene as vibrant as Chicago. Still, wouldn’t it be nice to bring some of this energy into your own home—to enjoy great music in the comfort of your own home? Why settle for a mediocre quality audio set up that is tied to one room? If you want to do your favorite songs justice and a create an immersive experience that rivals live performances by your favorite artists, then high-resolution and multi-room audio is the answer. Music is in your soul. You feel it in your bones. For you, music is like a religious experience, and now you want to transform your home into a space where you can appreciate every beat and trill. Whether it’s a home theater, multi-room audio, or to simply spice up your living room audio experience, you want a high-definition audio solution that will do your favorite audio tracks justice. The mystery behind the movie magic will always be a part of its charm. But the rules for replicating this experience yourself don’t have to be such a secret. Today, armed with the latest technology, you can bring Hollywood to life for much less than you might have imagined. Covering the glass with shades, blinds and draperies is an obvious solution to your sun-conundrum. But you actually need to use those window treatments—and use them wisely--to realize their full benefits. According to the U.S. Department of Energy, at least 75 percent of window coverings remain in the same position on a daily basis. There are countless reasons why: Depending on the number of windows in your home, adjusting each shade manually can be a terribly tedious exercise. If any of these windows are difficult to reach … forget about it. Then there’s this thing called life: You’re busy working, traveling, barely home long enough to take out the trash much less fiddle with the window blinds. For all of these reasons, motorized window coverings can be one of the best investments for a smart home. They’ll save time and money, protect your home’s interior, and ensure a comfortable home environment. A renovation is the perfect time to customize your living space and take advantage of the latest in smart home tech. The smart home market is on the rise, and many companies are starting to offer products that integrate seamlessly into the design of a house.